Download from iOS Store or Android Store now. 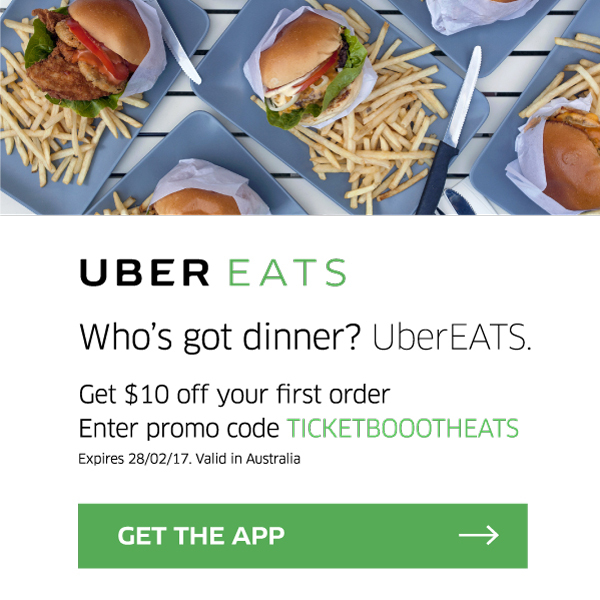 Ticketbooth has formed a partnership with UberEATS giving all Ticketbooth customers with the latest UberEats discount codes, deals, coupon codes and offers. Get the food you want, from the restaurants you love, delivered at Uber speed. UberEATS is a food delivery platform that makes getting great food from your favorite local restaurants as easy as requesting a ride. *Valid until 29/01/2019, in Australia only. 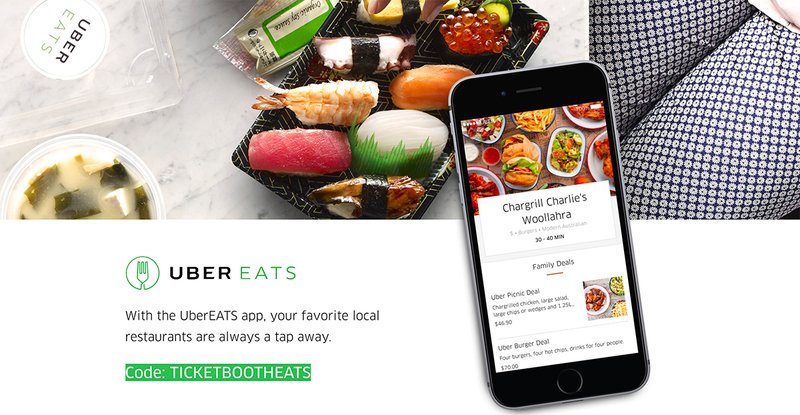 UberEATS is available Sydney, Melbourne, Brisbane, Perth, Adelaide. Sydney suburbs: Include the CBD, Surry Hills, Darlinghurst, Paddington, Rose Bay, Balmain, Drummoyne, Newtown, Bondi, Randwick, Alexandria, Zetland, Summer Hill, Crows Nest, Lane Cove and Neutral Bay. Brisbane suburbs: Include the CBD, Fortitude Valley, New Farm, Teneriffe, Newstead, Bowen Hills, Albion, Herston, Windsor, Wilston, Newmarket, Kelvin Grove, Spring Hill, Petrie Terrace, Paddington, Milton, Auchenflower, West End, Highgate hill, Dutton Park, South Brisbane, East Brisbane, Kangaroo Point, Woolloongabba, Brisbane City, Ashgrove, Bardon, Toowong, Taringa, St Lucia, Greenslopes, Cannon Hill, Norman Park and Indooroopilly. Melbourne suburbs: Include the CBD, Brunswick, Northcote, Fitzroy, Carlton, North Melbourne, Richmond, Prahran, Windsor, Docklands, St. Kilda, Southbank, South Melbourne, Albert Park, Port Melbourne, Kew, Hawthorn, Elwood, Caulfield North, Toorak, Flemington, Footscray, Yarraville, Essendon, Moonee Ponds, Bentleigh, Brighton, Preston, and Coburg. Adelaide suburbs: Burnside, Klemzig, Kensington Gardens, Hectorville, Stonyfell, Broadview, Erindale, Hampstead Gardens, Prospect, Marden, Glynde, Manningham, Tranmere, Magill, Rosslyn Park, Felixstow, Vale Park, Sefton Park, Beaumont, Glen Osmond, St Georges, Clarence Gardens, Cumberland Park, Westbourne Park, Hawthorn, Kingswood, Netherby, Urrbrae, Glen Osmond, Colonel Light Gardens, Daw Park, Mitcham, Torrens Park, Melrose Park, and Springfield. Perth suburbs: Inglewood, Coolbinia, North Perth, Mount Lawley, Mount Hawthorn, Leederville, Highgate, East Perth, Perth, Northbridge, West Perth, West Leederville, Glendalough, Wembley, Jolimont, Subiaco, Shenton Park, Nedlands, Crawley, Claremont, Dalkeith, South Perth, Belmont, Victoria Park, Kensington, East Victoria Park, Como, Karawara, Manning, Waterford, Bentley, St James, Scarborough, North Fremantle and Salter Point.